The fine folks at Square Enix don't seem to shy away from deeply philosophical and moral questions in the games released by the developer, and its next title seems steeped with these questions. I for one am already running in circles in anticipation Antique Carnevale, despite the fact we don't even have a release date or even a platform announcement. The prologue's overview has been released along with the first character trailer for Bernhard (below). The prologue involves a boy entering a labyrinth that sounds as though it traps the souls of the living and the non-living, or "people" and "dolls." People can move but dolls can't... does that mean a person who is incapable of movement is a doll, and vice-versa? At what point does humanity end and a new stage of life begins? The above trailer showcases Bernhard, one of Antique Carnivale's characters – presumably a protagonist. He is described as "the personification of the summons beast Wyvern" who guards the town on a regular basis due to his position as commanding knight of the Valamion. He has a strong sense of justice and hates jumping to conclusions. Bernhard is currently seeking the strongest masters of the next generation. Keep your eyes peeled on the Square Enix YouTube channel for the next week, as it continues to release character trailers for the game; expect four new ones on July 7, July 10, July 12, and July 14, with further news on the game itself expected July 18. Most romantic visual novels are all about the beginning of new love – the meet cutes, the flirting, the building of a relationship. 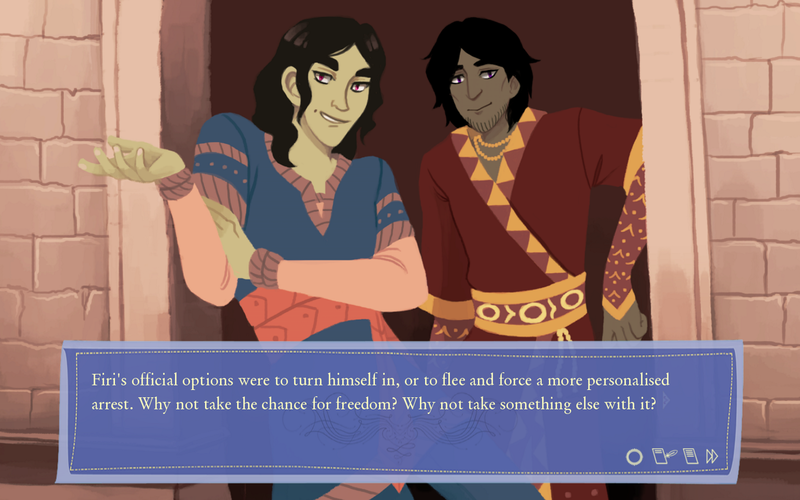 But Kiwi developer Maddi Mackenzie decided to take a different approach with the new visual novel Inverness Nights, which looks at how we end those relationships. Set in a fantasy 18th century Scotland, the game follows Tristram Rose, an immortal sailor in the midst of a dramatic break up with his partner, Alasdair. Meanwhile, he’s picked up a lucrative contract from a mysterious client. How will you balance the competing priorities of reconciliation with Alasdair, his work, and trying to find out more about his new client. As well as Mackenzie’s story and background art, Inverness Nights features artwork from Alyssa Dalangin, Abigail Bullock, and Crista Megee, and a UI designed by Mystery Corgi. It’s just launched for PC and Mac via itch.io, where its standard price is $12 USD – though it’s currently 33% off as part of a launch sale. The first Demon Gaze, released back in 2013 on PlayStation Vita, took us all a bit by surprise. On the surface it looked like yet another anime dungeon crawler, complete with cute girls and turn based action, and while we do love those games, they’re rarely the kind of standout, game of the year-like experiences. But Demon Gaze was something special, as it turned out. Not only did it look better than anything that we’d seen in the dungeon crawler genre before, but it also offered a surprisingly deep narrative, and some incredible level design. So we’re looking forward to Demon Gaze II, which NISA has announced for a Fall (Spring, for us south of the equator) release this year. Once again, the art style looks gorgeous and the opening cinematic (video above) has us very excited indeed. As an added bonus, this one won’t be exclusive to the PlayStation Vita. It is getting a Vita release (and good on NISA for being one of the few left still supporting the platform), but it’s also getting a release on PlayStation 4. This is really great news because of all the genres out there, the one and only one that the PS4 hasn’t been well represented in by now is the Wizardry-style dungeon crawler. Get ready for a good dose of terror, as NIS America has announced that Yomawari: Midnight Shadows will launch internationally this October. The horror title follows two girls at the end of their summer vacation. The girls, Yui and Haru, head to a mountain clearing to watch fireworks, but as the show draws to an end the nearby town becomes completely enveloped in darkness. On their way home, something jumps from the shadows and the girls find themselves separated and afraid, trying to find not only one another but also their way home. Yomawari: Midnight Shadows is the sequel to 2016's cult horror title Yomawari: Night Alone (our PS Vita review can be found here). There is an entire town to explore, complete with abandoned homes and dark sewers. Each character will have a different experience, and something found by one may later help the other. Japanese spirits seem to come to life in the title, with a press release promising "horrors birthed from nightmares, oddities that will make you question what is real, and mysteries that may keep you up at night." Yomawari: Midnight Shadows will be released on October 24 in North America and October 27 in Europe. The game will be available on PC via Steam, PlayStation 4, and PS Vita. Comparatively, Midnight Shadows is being released in Japan on August 24 for the PS4 and PS Vita. There is a lovely limited edition available (PS4 or PS Vita only, sorry PC players) that includes the game, a set of acrylic charms, a glow-in-the-dark cloth poster and a collector's box.